For cruisers looking for something unique, Teppanyaki on Norwegian Escape offers an authentic Japanese hibachi experience right in the middle of 678 Ocean Place. Tucked away on the starboard side of the ship, this restaurant is open nightly for dinner from 5:00pm to 10:15pm. 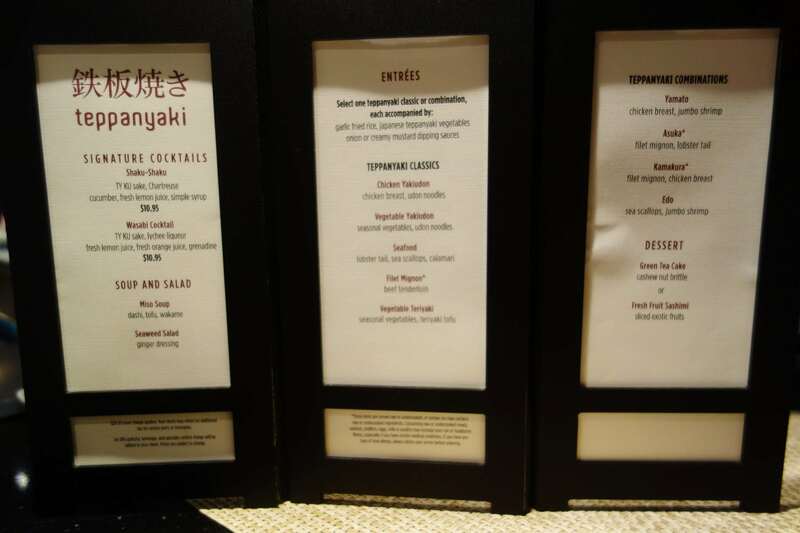 Unlike some of the other specialty dining on Norwegian Escape, Teppanyaki has a flat fee coverage charge of $29.95. 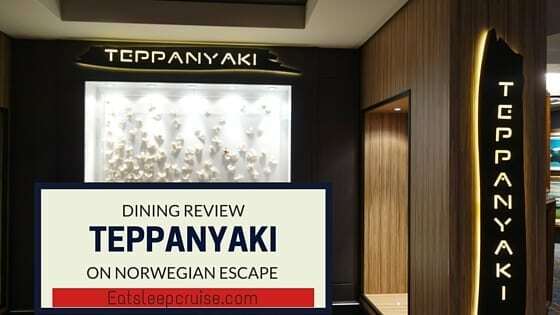 Many vessels in Norwegian Cruise Line’s fleet feature this restaurant; however, Teppanyaki on Norwegian Escape was the first time we had the opportunity to dine at this venue. 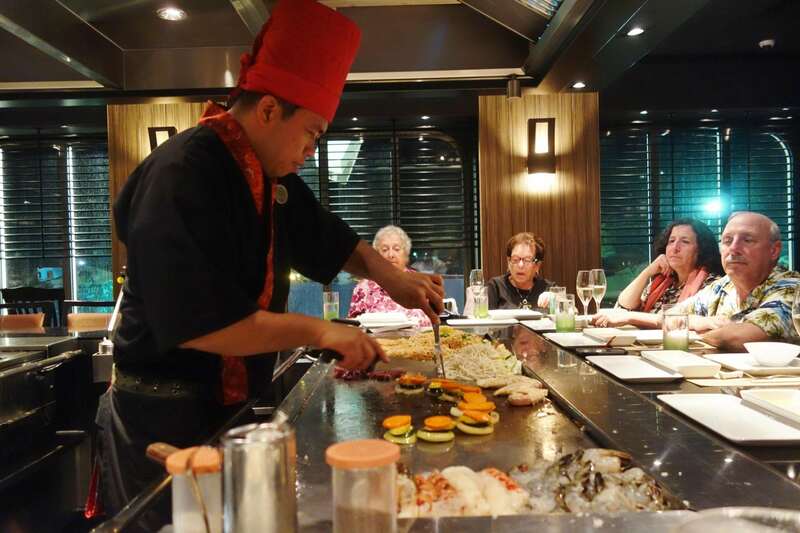 This Japanese hibachi restaurant offers a rather different dinner experience with shared seating around the hibachi grill and incorporation of live chef performances during the preparation of the food. 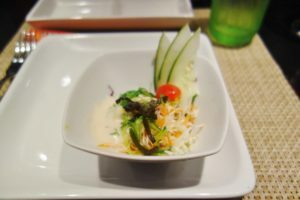 This venue is included in the specialty dining package, so if you plan on dining at a few specialty restaurants during your cruise, then this package is worth purchasing. Order as much as you like from the menu and be prepared as the chef aims to please. 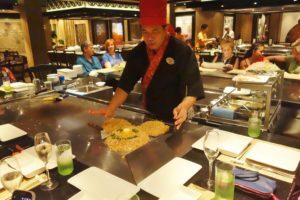 We dined at Teppanyaki on Norwegian Escape on Day 4 of our cruise. Like all of our other reservations, we pre-booked 90 days before boarding. Given the unique setup of the restaurant, seating times were a bit more limited, but we were able to secure a 6:15pm reservation. Getting to the restaurant just in time, we ended up being right behind a party of six with whom we would share our grill and chef. The eight of us were in for a culinary tour de force this evening. After being seated toward the back of the restaurant, it was hard not to pay attention to one of the chefs halfway through his performance off to the left of us. Watching him slice, dice, and add his own humor, we got a short preview of what was to come with our own grill master. Our waitress came over to the table and reviewed the menu with everyone, explaining how dinner would progress. Asking if anyone had food allergies, we let her know about my allergy to scallops since they were offered on the menu. As it would happen, a few people at our table did order scallops, so the chef was sure to keep the preparation of those orders until last. 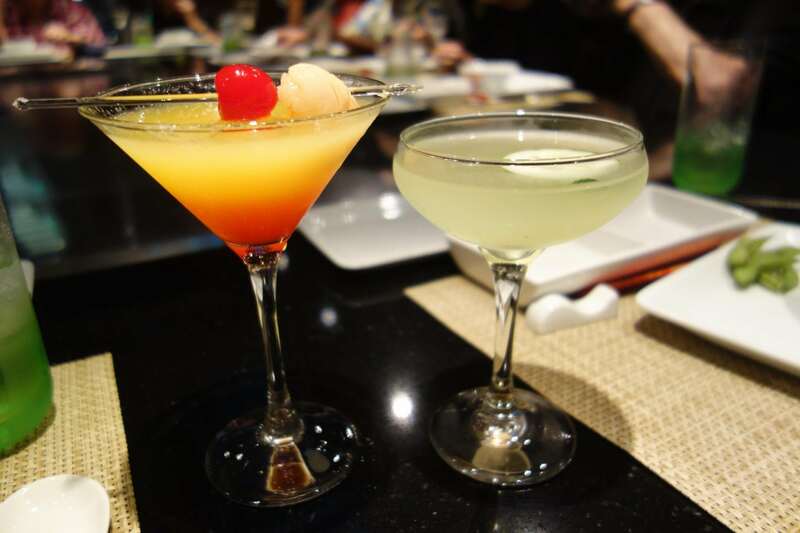 First up was a round of cocktails, two of the specialty drinks on the menu. Not necessarily drinks that we would consume on a regular basis, but they did add something special and unique to our dinner experience. 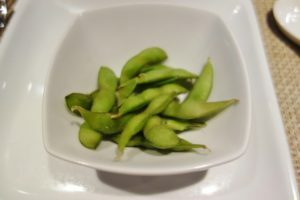 Returning with the drinks, our waitress had not even taken our orders yet, but the first course of Edamame beans were being served. Teppanyaki on Norwegian Escape was going to be my kind of restaurant! While I am sure I didn’t need to eat them, they were probably going to be the healthiest thing I ate all night! After reviewing the menu, I officially ordered the Asuka, including steak and lobster. But, I also ended up sampling some calamari and shrimp later on. 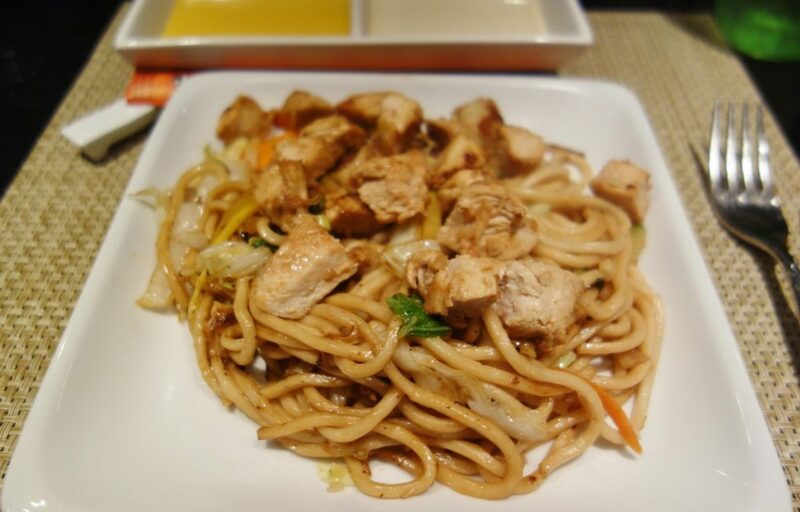 As you might have guessed, the Princess ordered the Chicken Yakiudon. 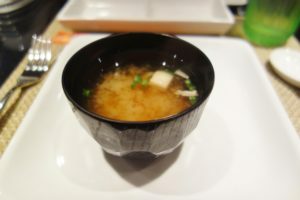 It seemed like we had just finished our starter, when the next dish, miso soup, was served. Not exactly one of my favorites, but I did try a few spoonfuls. I had to save some room for the onslaught of hibachi grilled treats that were soon to come. About the time our table was finishing up the soup, we were introduced to our chef. Having already witnessed some impressive knife wielding from the chef behind us, our chef had some stiff competition. He was not as playful as the other chef, but he came ready to entertain and cook. As he was verifying orders and allergies, I made it a point to ask if he could add some calamari to my order. He was happy to oblige. It was now time to return to the next course, the Seaweed Salad. Tastier than the miso soup, it had the consistency of a cole slaw salad with a lighter dressing. The Princess was not really impressed with any of the starters though. 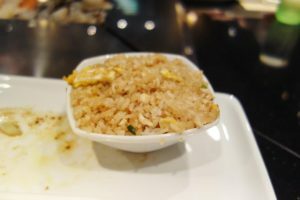 As we were finishing up the appetizers, the chef began frying up the next course, the fried rice. It is not even fair to call these hibachi masters just chefs. They are really culinary artists, mixing cooking with visual displays to put on a truly delicious show. Making way more rice than was necessary, he had a little fun with the presentation of this course. Also being Disney fans, we were sure to grab a few photos of the chef’s interpretation of Mickey Mouse. The rice was delicious, with just the right mixture of soy sauce, eggs, and vegetables. Even the Princess concurred. Teppanyaki on Norwegian Escape was starting to win her over. Me? I was already is Japanese steakhouse heaven, and we were just getting started. As if the first bowl of fried rice wasn’t big enough, the chef had so much left over that he kept trying to offer seconds, but we were all too full to take him up on the offer. Next up on the menu were the vegetables, which the chef creatively made into a rainbow-like pattern, all the while making conversation and jokes to keep us engaged. I enjoyed the crunchy stir fry vegetables, so I was happy to take the Princess’ share as well. I believe only one other patron at the table besides the Princess ordered a meal with udon noodles. Too bad he didn’t make extras because they were divine. Actually, the wife’s entire entree, including the chicken, was great. Not really one to put many descriptors on her meals, she did say that of the four dinners she had thus far (Moderno, Manhattan Room, and Cagney’s), this one was by far her favorite. As these meals were prepared first, the rest of us at the table were starting to get jealous. But before long, the chef started serving up some of the other choices. Given that certain meats cook at different rates, the rest of us got served our meals in stages. My medium Filet Mignon was among the first up. Lightly seasoned, it was cooked to just the right tenderness that it quite literally melted in your mouth. What is surf and turf without the surf? Lobster was next on the menu. Of all the food choices, this was the least impressive in my opinion. Don’t get me wrong, the lobster was well cooked, but I just prefer my lobster boiled with a little butter. Of course, with so much more food to come, I was not going to leave hungry. 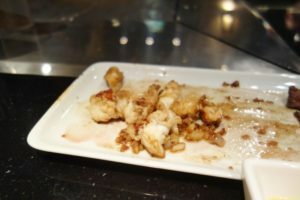 Where the lobster at Teppanyaki on Norwegian Escape fell short, the shrimp and squid shined. First up were the shrimp, which I did not order. 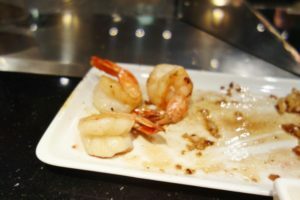 Our chef must have noticed that I liked to eat, as he just threw some shrimp on my plate too. Cooked just a few minutes, they had a light crispy texture and were quite delicious. Last up was the squid. My late game entry. 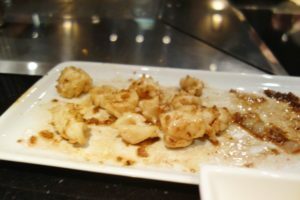 Trying to find room, these tender calamari were light enough that I could squeeze them into the little space left in my stomach! Rounding out his cooking with the scallops, our chef had truly given us a fantastic dinner and a show experience, complete with perfectly cooked selections, entertaining tricks, and stories about his family and time spent cruising with NCL. While our waitstaff was attentive as well, it was really the personality of our chef that made the experience complete. As he began to clean the grill, we were greeted with more food choices. Yup, dessert. 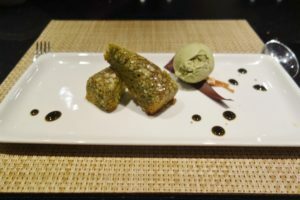 Neither of us needed dessert and the selections were quite limited, so we both got the green tea cake. Not to be wasteful, we each had a few bites of the dessert to try it, but it was nothing to write home about. Overwhelmed with so much great hibachi food, we were both literally stuffed. 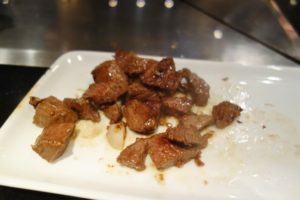 Even if you are not a fan of paying for dinner while on a cruise, you should consider making an exception for Teppanyaki on Norwegian Escape. 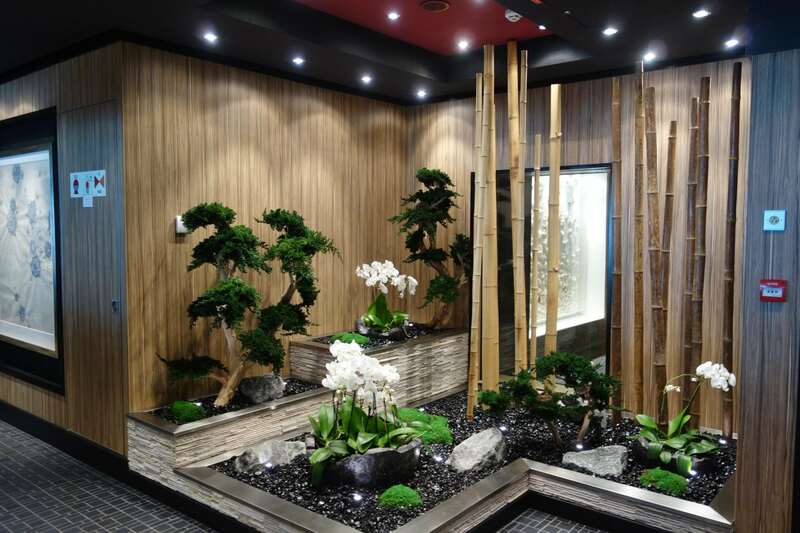 If you are a fan of hibachi restaurants, this one revivals any one you will find on land. If you have never dined in this type of atmosphere, what better time to test it out than on vacation? Service was solid, and the chef was the superstar. The cooking and entertainment combo is certainly worth the up-charge. Do make sure to get there on time and plan for a solid 2 hour dinner. We got out just in time to walk across the way to Headliner’s for 8:30pm. The restaurant is great for large groups, but even as a couple, we mingled with our table mates and the chef. It is a very social and relaxed atmosphere. We can’t wait to get on another Norwegian Cruise Line ship featuring this restaurant for another round of yummy goodness. 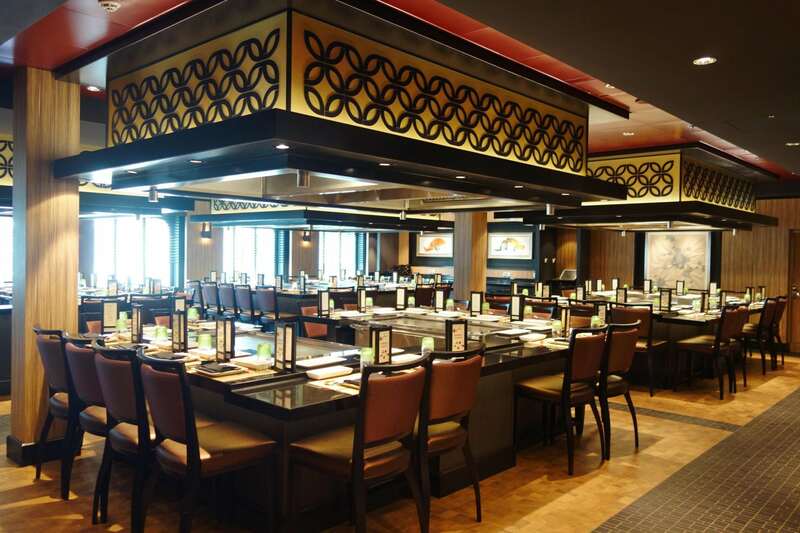 Have you dined at Teppanyaki on Norwegian Escape or any other ship in NCL’s fleet? Do you think the upcharge price is worth it for this dining experience? Drop us an anchor below to give us your thoughts on the food choices and specialty dining available on this newest ship in Norwegian Cruise Line’s fleet. 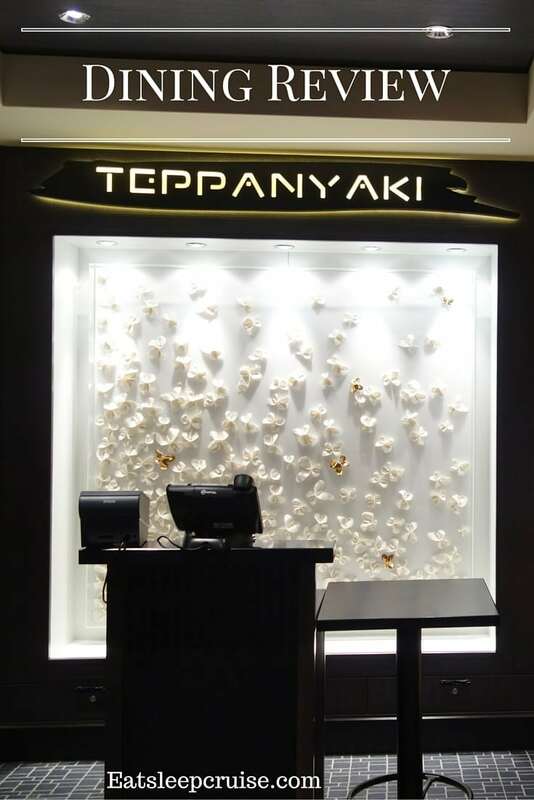 I have dined at Teppanyaki on both the Gem and the Epic, hands down the best meal I have had on those two ships. I usually go for the filet, my wife loves the shrimp and scallops. We bothe love the vegetables. Hi Mike. Appreciate the comment. Yes, Teppanyaki is a great time. The food and “show” make it worth the up-charge. All of the food we sampled was great, even if the Princess is a picky eater. We have not sailed on the Gem or Epic, but glad to know that the restaurant also delivers on those ships. When is your next cruise? Thanks for reading. We are sailing the Epic in October, transatlantic from Barcelona. Our fifth transatlantic. Sailed Allure of the Seas last October.